Croatia is a small country in south-central Europe, and ever since Game of Thrones came out, it has become more popular as far as tourism is concerned. The medieval city has millions of tourists every year, but that is not the only attraction. The beaches open to the Adriatic Sea are vibrant, and although there are many of them, a lot of them are covered in pebbles, and tourists avoid them. Nevertheless, Croatia is a beautiful country with a rich history and culture. It is definitely worth a trip. But before you leave for Croatia, you should check whether or not you need to apply for a visa. Croatia is a part of the Schengen Area Agreement, although it has not been fully implemented. Even so, the visa policy is quite lenient. Chances are that you only need a passport to go to Croatia. 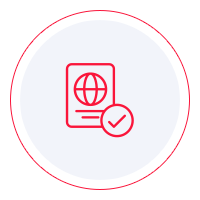 There are two categories of nationalities that are exempt from getting a visa. First, we have the beneficiaries of the freedom of movement within the European Union, and then there is the visa waiver program. As long as you find your country of origin on one of those lists, you can board a plane without a visa. If you want to learn whether or not you need a visa and you are in no mood of going through the visa policy of the Schengen Area, we recommend that you use the Visa Checker. It is a tool in which you select your country of origin from the drag-down menu and select Croatia as your destination. If you do not need a visa, you can plan your trip. If you do, you will be given a list of the embassies you can use to apply. Unfortunately, iVisa cannot process Croatia visa applications at the moment since electronic visas are not available for the Schengen Area. However, we would like to help any way that we can. That is why our support service is free of charge and at your disposal 24/7. If you need to refer to the services of a Croatian embassy to get your visa, you need to see to the requirements and whether or not you meet them. While you can do that on the internet, we advise that you call the diplomatic mission itself. It is the most reliable source of information. Websites are not always brought up to date on time, and that can lead to errors. Just give the embassy a call, and you will find out what you need to know. Nevertheless, what we can tell you is that you need a passport that is valid and remains as such for at least another 6 months from the date of arrival in Croatia. For further information, contact the nearest embassy of Croatia. Even if we cannot do more at the moment, as soon as electronic visas become available for Croatia, we will be able to provide more assistance. Until then, we hope that your experience at the embassy is positive and that you have a smooth Croatia visa application process.